Ben Tuck Racing is very pleased to announce a new partnership with Park Plaza Hotels & Resorts. The agreement with the global hospitality brand will continue for the remainder of the season and represents the collaboration of two successful brand stories, both committed to delivery, excellence and achievement. Park Plaza Hotels & Resorts is part of PPHE Hotel Group which operates a dynamic and growing collection of individual hotels in some of the world’s great cities and resort destinations. Each hotel has its own creative design approach, enhanced by vibrant bars and award-winning restaurants. Ben Tuck is RSF MSA Young Driver of the Year. He claimed 3rd place in the 2015 BRSCC Mazda MX-5 Championship in his first full season of racing achieving 3 wins, 6 podiums and 3 fastest laps through the year. He is currently in his second year of racing, competing in the British Caterham Supersport Championship where he has taken 1 win, two 2nd places, 2 fastest laps and a lap record from the last 3 races alone. BTR is delighted to be working with Park Plaza Hotels & Resorts. “We’ll be working hard to gain even more success in the Caterham final round at Donington Park in October” Ben Tuck promised. Park Plaza Hotels & Resorts’ support came at a critical time for BTR just ahead of the last race at Croft in mid September. “I’m so excited to be working with Park Plaza Hotels & Resorts” said Ben, “without them, and our other partners we’d not be achieving the successes we’ve already had, particularly at Croft”. 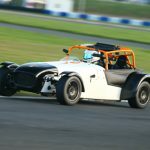 Ben Tuck’s 140hp Caterham Supersport race car will be proudly carrying Park Plaza branding at the season finale at Donington Park on 15th / 16th October.